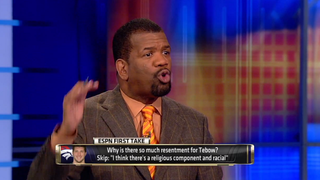 Well, actually, the Rob Parker cornball comment became a big headache for the CEO of ESPN's parent company, Disney. At a Disney shareholders meeting yesterday, one guy representing a conservative group, the National Center for Public Policy Research, used Parker's comment to demonstrate that ESPN is totally in the tank for liberals. Imagine that—both liberals and conservatives alike were annoyed by Parker's comments! Now, shareholders meetings are famous for bizarre, long-winded speeches by crazies. A CEO is always ready to bat this stuff away, and Disney's CEO Bob Iger immediately did just that, conceding that ABC and ESPN have been "guilty of making mistakes" before he defended them. And no one would claim with a straight face that ABC News or ESPN have over-the-top liberal biases. But? Parker's comment now can live on in the conservative blogosphere for life. It's ammunition (and ammunition from occasionally relentless critics) and proves that "cornball brother" still has legs, even two months later. ESPN president John Skipper doesn't want to receive a cranky call from Iger wondering what's up with that morning show on ESPN's channel. This explains why Skipper dispatched a senior member of his newsroom to sit in on First Take meetings and take surveillance—something Skip Bayless is less than thrilled with, we hear. But despite the headaches and the punishment that followed, First Take's pernicious little influence continues to bleed into the network's franchise show.